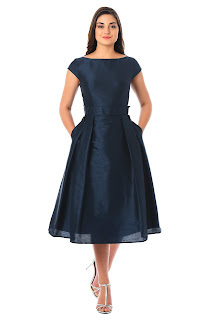 In December eShakti introduced eShakti FX on its website. Now they've expanded the service on Amazon! If you answered “yes” to any of the questions above you’ll want to swing by and check out eShakti FX Custom Styling, now available on Amazon Custom, with options to customize the neckline, sleeve and length. You can find the styles on Amazon Custom by searching for 'eShakti FX'. With this amazing customization tool, you get the item of clothing you want that fits you perfectly at an extremely reasonable price. Just enter your measurements and then select the optional features. Want a round or v-cut neckline? Want long, short or no sleeves? Want a short skirt or below the knees? The FX feature lets you select a multitude of different options so you have exactly what you want! It’s fun to do because you can watch the picture on the page change as you pick different selections. From now until 2/17/19 you can receive 30% discount when you use the eShakti FX Custom Styling on Amazon with promo code 30FXONAMAZON. I received compensation for this post. The opinions within this post are of my own. Please do your own research before purchasing products or using services. Your opinions and results may differ. Great deals for eShakti FX Custom Styling.